For years, I’ve been trying to recreate the carnitas I use to eat at the little outdoor restaurant in Toluca. All of the recipes I tried were good but I’ve never had it nailed until I took a cooking class from Chef Cardenas. In fact, Carnitas were an afterthought. During our pre-shopping tour in the market, several of us commented that we would love to learn to make good Carnitas. That’s all it took. We stopped at a little Carnita place across from the market to taste them while Chef Cardenas bought a slab of ribs to take home and add them to the menu. Now I just have to grow an orange tree in my back yard so I can do the same thing he did – pick a fresh orange and squeeze it into the carnitas. That may be a real trick living in Chicago. So how many chefs do you know who would change up a menu at the last minute just to satisfy his guests? Like I said earlier, I started out with the best. When you taste these Carnitas you’ll know why. Put all of the above into a cazuela and cover with water. Allow to simmer for approximately 3 hours, or until water is evaporated. Watch towards the end so pork does not burn. Add 1/3 c. pork fat. Add the juice of one orange. Continue to simmer and allow pork to brown. Turn frequently. 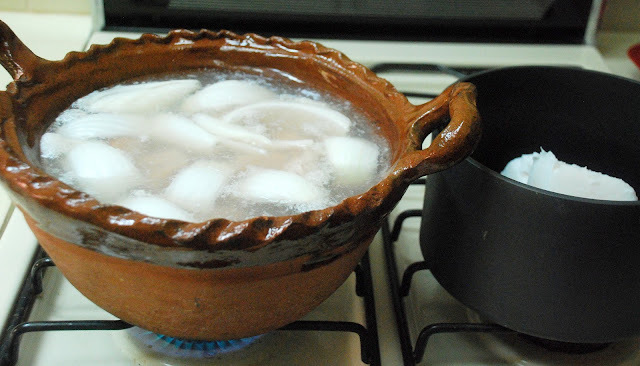 Remove to platter and discard the grease from your cazuela. Add salsa verde (approximately 2 cups) to brownings, using a wooden utensil to pry up crust from the bottom of the pan. Serve with fresh, warm tortillas.